Dear Esther creator, Dan Pinchbeck, on storytelling and imagination. According to creator, Dan Pinchbeck, Dear Esther has something vital in common with indie mega-hit, Minecraft. Well, actually, it's not so much a "thing" as a lack thereof. Minecraft and Dear Esther both lack the same thing: a predefined narrative. "We're not in the business of writing a plot -- we're in the business of giving you the tools to create your own," Pinchbeck said at GDC Europe today. "There is nothing more powerful than your own imagination." Pinchbeck argues that Dear Esther is "a bit like story Minecraft." 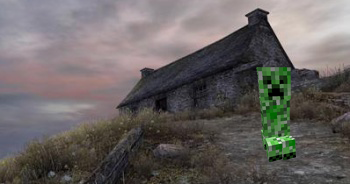 In Minecraft, players arrange blocks into pleasing (and often phallic) shapes; in Dear Esther the game semi-randomly chooses snippets of narration to create a vague storyline. Both games rely more on atmosphere than a traditional narrative thrust. According to Pinchbeck, players often make a "story" out of anything they do, and thus, such stories are "an inevitable product of playing the game." He argues that developers don't need to constrain players to a set storyline, instead they should use what story there is to deepen the tone and complexity of the game world. "Use your story to represent the representable," he said. "Story is inevitable - so why write the obvious?"